Sunday, August 4 1907 -- The Angels have been on an extended road trip to north California. Seems when the Pacific Coast League schedule was being decided on that the teams up in that part of the state had complained that attendance was off last year, and they feared that without an extra measure of home games this year they would be in serious trouble. Angels manager Hen Berry took it upon himself to offer up the team for more than the usual measure of away games. Sunday, August 4 1907 -- Probably the biggest story of the year was the Standard Oil anti-trust lawsuit. The company was fined 29 million dollars, the largest fine ever levied by a U.S. court. 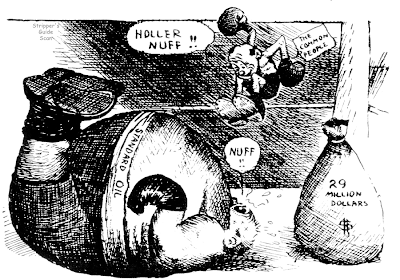 Now that Herriman was concentrating for the time being on sports cartoons this small drawing was his only contribution to the extensive coverage given the story. 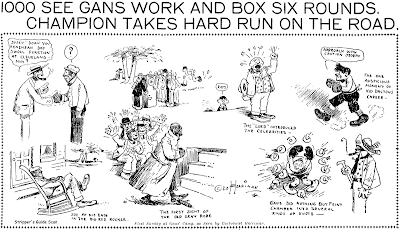 Monday, August 5 1907 -- Joe Gans has begun his training regimen for the upcoming fight (which will never actually come off). His camp is beseiged by fans as he does some sparring. One of his opponents, Kid Dalton, forgets to bring his boxing tights and enters the ring wearing rolled up trousers. Post-Hall Syndicate, Inc., became effective as the new name of New York Post Syndicate, March 1, according to Robert M. Hall, the syndicate's president and genera1 manager since he organized it four years ago. The company was not incorporated as New York Post Syndicate until August, 1946. Hall, one of the corporation's principal stockholders, indicated that the change in name was a natural development, more representative of the syndicate's recent activities. During the past several months, the syndicate has launched new features, including "Tex Austin," an adventure comic, and the "Wizard of Odds," a facts panel; signed on Walt Kelly's original animal comic "Pogo," and has picked up new clients for Columnist Victor Riesel's "Inside Labor," which involved changing the New York outlet to the New York Mirror. Post-Hall Syndicate is a success story. Hall began it in 1944 with New York Post features such as Earl Wilson's "It Happened Last Night," Sylvia Porter's finance column, "Your Money's Worth," and Samuel Grafton's "I'd Rather Be Right." Within a short time, the syndicate began contracting features on its own, developing the action strips, "Mark Trail," and "Bruce Gentry," and the story-problem comic, "Debbie Dean." The syndicate also obtained such features as Herblock's editorial cartoons, Elise Morrow's "Capital Capers," Pierre de Rohan's "Man in the Kitchen," Sterling North's book reviews, Major George Fielding Eliot's discussions of defense and tactics, Margene Danch's "May Mian," and Jimmy Cannon's sports column. 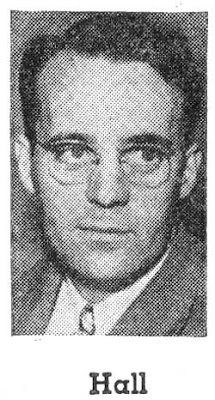 Hall was formerly sales manager of United Feature Syndicate, which he joined in 1935 directly from the Columbia University Graduate School of Journalism. Earlier he had worked for the Providence (R. I.) Journal throughout high school, three years at Northeastern Law School and four years at Brown University. Blog readers with extra-sticky gray matter may be thinking, "Hey that Stripper schmuck is recycling obscurities. I knew he had to run out of them eventually!" Not so, not so. Still barely scratching the surface! 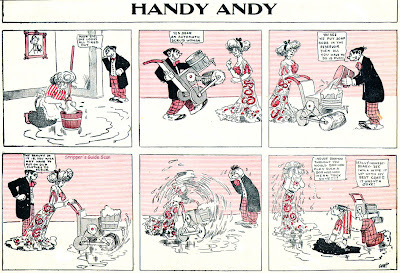 You may remember that back on April 10, 2008 we featured Handy Andy as an obscurity, but that was a version by Ed Goewey from 1904-05. That Andy was a strongman who had a tendency to bite off more than he could chew. This Handy Andy, on the other hand, is a fellow who invents labor saving gadgets, usually for his adoring better half. Johnny Gruelle would one day be the celebrated creator of Raggedy Ann and Andy, but in the 1900s he was just another journeyman cartoonist. 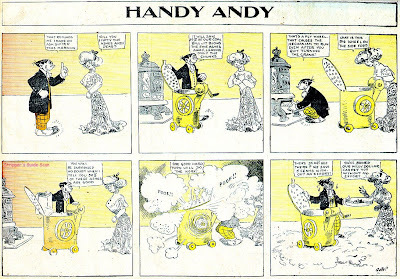 As 'Grue', his pen-name of the time, he created Handy Andy on his second go-round with World Color Printing in 1908-09 (he also did a short stint there in 1905). Handy Andy first appeared in the World Color Printing comic section on November 1 1908 and Gruelle didn't stick with it long, last penning the feature on January 31 1909. The strip was then taken over by a fellow signing himself 'Bart'. He did the strip from February 7 to July 18 1909. I have always gone on the assumption that this 'Bart' was Charles Bartholomew, the famed Minnesota cartoonist who went on to be a big player in mail order cartooning correspondence schools. However, I've always harbored a niggling doubt. Why would Bartholomew, who was a pretty big fish in the little pond of Minneapolis, be doing journeyman work (and a lot of it) for World Color Printing? Anyone with a dissenting opinion regarding World Color Printing's 'Bart' is invited to make themselves heard. Here's an early strip by Cliff Sterrett, who went on to pen Polly and her Pals to considerable acclaim. When a Man's Married began in the New York Evening Telegram on May 13 1911 as one of their many less-than-daily strips (boy, wouldn't I love a less cumbersome, more descriptive term for that). 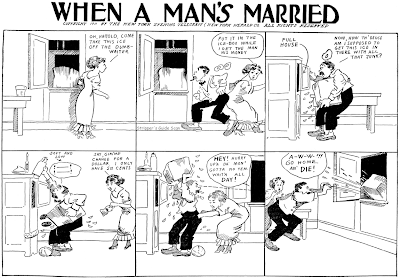 Sterrett penned this strip along with several others until he defected to Hearst in December 1912. His last entry in this series was on December 12. The Telegram must have thought a lot of Sterrett's strips, because when he left they were all continued by others. When a Man's Married was reassigned to Jack Farr, whose first entry in this series was on December 19. 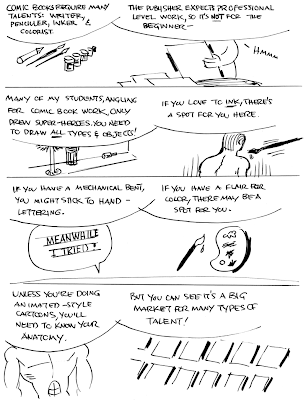 Farr continued the strip for eight years, quite a run for a strip that practically no one remembers. The strip last ran in the Telegram on November 23 1920.